The visitor numbers to the coastal community of Bahia de Caraquez have swelled significantly. Hotels and restaurants are brimming with business, the beaches full of families, both ferries operating at full capacity and the gas stations are now regularly out of fuel. Even the grocery store shelves are depleted of some items - there was no cheese on the store shelves. Our current apartment is very central and is located above a pizzeria and bakery. The daily smells are heavenly, and so far the aromas are enticing but not fattening. Targeted towards their visitors both from the Sierra mountains and internationally, there is music, a variety of entertainment, a parade, cartoon characters, and fireworks. This was a family event with community clubs selling cakes, food, and drinks. There are often causes for celebration here ranging from the installation of the mayor, 40th anniversary of a local school, religious events, various association or club events, a business's grand opening, or an individual's birthday ! Every school has a student queen, and each year's inauguration is celebrated with pomp & circumstance, attended by all the previous year's reigning royalty. The last several days a small group of about 8 colourfully dressed jokers have been traversing the community on long stilts, playing music and performing acrobatic and gymnastic routines. Watching them hop on one leg on stilts, or lift themselves up onto another's shoulders is awesome. This Sunday NBC airs the Miss Universe pageant where 84 contestants will compete for the world title. Ecuador's Sandra Vinces, 19, and Iceland's Ingibjorg Egilsdottir, 24, are early favourites on the social networking sites. Unique local community celebratory events in North America such as Regatta in Kelowna, Spoolmak days in Kamloops have mostly disappeared , even the Pacific National Exhibition survival in Vancouver was in question ! Although Bahia de Caraquez has been pro-claimed an "eco-city" and holds some international prominence in this declaration, the municipal government no longer seems supportive of the direction. Established recycling programs have been abandoned due to lack of funding, and education programs and social awareness is no longer paramount. Several visiting international students who were completing their educational theses in eco-tourism and ecological and environmental sustainability have been very disappointed with this turn of events. 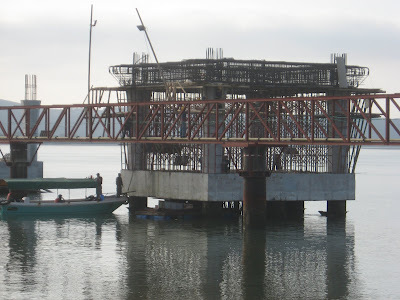 Clay Unger and Patricio Tamariz have begun the process to rescue the Eco-city from what has become almost total disregard by the municipal government by engaging concerned citizens of the community as Friends of the Eco-city. Ecuadorians are able to rapidly adapt to change reflected recently by Ecuador's innovative new constitution - a world leading document providing new national purpose. Environmental protection of nature in Ecuador is now legislated by recognizing nature's rights to exist and function. While laws still need to be developed the contemporary living processes of resource extraction, energy production, agriculture, manufacturing, transportation, and housing developments will need to adjust to the new environmental consciousness. Starting with the offshore Galapagos Islands; vast unpopulated coastal areas; moving inland to cloud forests, and the Andean peaks with active volcanoes; descending into the rainforests of the Amazon Basin providing oxygen for the planet, the equatorial named country of Ecuador hold's the world's richest diversity of birds, plants, and animals. A long-time resident of Bahia de Caraquez, journalist & professor Maria Soledad Vela was instrumental in the development of this new constitution. 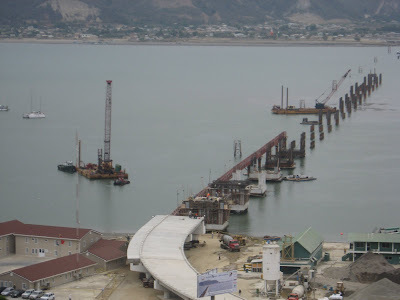 The National Corp of Engineers is currently constructing the longest bridge in Ecuador to cross the river estuary. Progress is estimated at 40 % completion. Our walk by the project last night reflected that while any single one of the pylon support stations have yet to be completed, nor any of the bridge deck installed, they have changing colour illumination on the first two stations! If it is to be illuminated in its entirety it will indeed be an impressive feature at night. Stephen Covey said "Trust is the one thing that is common to every individual, relationship, team, family, organization, nation, economy, and civilization throughout the world - which, if removed, will destroy governments, a thriving economy, influential leadership, friendship, the strongest character, and the deepest love. On the other hand, if developed and leveraged, trust has the potential to create unparalleled success and prosperity in every dimension of life." Perhaps leaders throughout America will notice Ricardo Martinelli's (Panama's newly elected president ) leadership example. Speaking directly to high corruption levels in Latin American countries, already a wealthy businessman, he successfully campaigned on the slogan "Other politicians enter politics poor and leave rich." In his debut leadership month he has donated his entire $ 11,000 monthly salary to charities excepting $ 1; raised 20,000 policemen's salaries by $ 100 per month (33 %); implemented a $ 100 monthly allowance for over 10,000 elderly residents without pensions; and is cracking down on wealthy businessmen's tax evasion. Resourcefulness – the people are uninhibited, and imaginative - able to accomplish so much with ingenuity, muscle, and basic tools. I have been caught many times seeking tools to accomplish a task only to have a local person easily complete the task without the aid of any additional tools. (be quiet Al). For example in construction, the use of power tools is rare, and the cement required for an office building, apartment, or house is mixed by hand. Reality of Death - funeral processions consist of a highly visible walking parade of family & friends from the home or church, through town to the cemetery. They are fairly common, and simple, or elaborate based on family wealth. One day outside of the school the children and teachers gathered to watch an ambulance return a deceased body to the family home. Immediately following a variety of family members arrived, weeping, to make the necessary funeral arrangements. Society here seemingly provided the mourning family very little privacy. Safety Standards – laws & regulations regarding safety either don't exist or are not enforced. While the "lack of rules" can seem liberating or chaotic, people seem to be much more aware & careful. The absence of the common safety net of insurance coverage may also be a significant factor in increased responsibility. When was the last time you rode an ATV or motorcycle downtown without a protective helmet at whatever speed you desired? or walked across a busy multi-lane highway with precision timing enabling traffic to continue to flow and your life's continuance? In Latin America it is a regular occurrence without incident. There are far fewer accidents in South America than in North America! Food standards – while there is probably room for some improvement in consistency in the southern hemisphere, meat, poultry, seafood, fruit, vegetables, dairy products are fresh from their origin to your kitchen table. The gastronomic experience is difficult to equal in the Northern hemisphere due to a variety of agencies protecting health standards, but in the process preventing the possibility of equivalent freshness. It is possible that in the southern hemisphere on occasion one may experience stomach discomfort due to poor hygiene in food preparation, or the presence of unhealthy bacteria. In most of the world, coastal areas are populated by the wealthy. 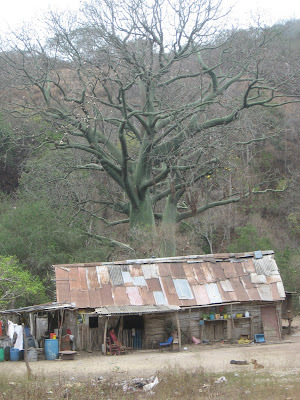 Ecuador's coastal areas often surprise visitors as they represent the poorer regions of Ecuador. They are inhabited by fishermen, agriculture workers, and common working folks. In Bahia de Caraquez the utility companies do not send any invoices. Telephone, water, municipal taxes, electricity, television, and internet are all the individual consumer's responsibility to pay in a timely manner monthly. How is that for leading in environmental and efficiency methods! However North America is significantly ahead when it comes to society's consciousness of littering. We watch people throw their garbage onto the sidewalk or street even if there is a receptacle for garbage just a few feet away. Education, pride in their country, refundable container deposits and littering penalties are urgently required as the litter can be problematic and unsightly. Bahia's has high cleanliness standards when compared to other cities in Ecuador. Household pets cats and dogs are not well looked after here and they roam the neighbourhood streets socializing and scavenging food. Their health conditions vary greatly depending on their owner's care and their respective place in the local animal kingdom. Restaurants "pop up" or disappear here with much higher frequency than North America. Due to the entry thresholds being much lower (almost non-existent) inconsistent hours of operations, service levels, food quality and patron volumes. To open a restaurant you simply need a table and a surplus of food one evening and you open your home to the public as a restaurant. Depending on your success you may choose to open again "sometime." Some of the best meals are prepared with loving care in a "grandmothers kitchen." A more permanent and traditional commercial establishment is inexpensive to renovate and fit with a commercial kitchen. Neither Bahia de Caraquez nor San Vincente with a trading population in excess of 100,000 residents have any internationally recognized chain restaurants, and the selection of ethnic cuisine is limited. The concepts of specialized stores with service - butcher shops, bakeries, and fresh fruit & vegetable farmer's market, health food & candy stores, a trend which is regaining popularity from the superstores and mega-malls in North America, are alive and well here with tremendous diversity and selection. Is the southern hemisphere 50 years behind or leading the way in this area …? The southern hemisphere has little inhibition, or perhaps the northern hemisphere, in particular Canada, is overly conservative. Latin music & dance is very expressive and spontaneous; swimsuit material is scarce; breastfeeding a baby does not require any privacy, nor does a man urinating in public. People with a wide range of disabilities are common, accepted, and integrated into normal society life not marginalized or treated differently or specially. Statistically I don't know if there is any higher occurance of disabilities here. For example we watch a teenage paraplegic walk down the street using crutches keeping pace with a group of his friends laughing and joking. 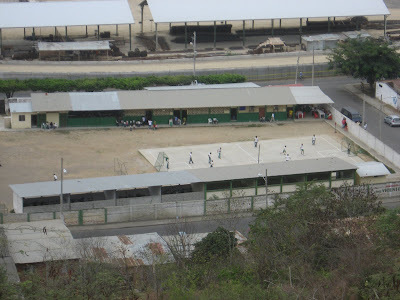 I spent several weeks teaching secondary students in this Ecuadorian school. In a classroom with a single grade you have a tremendous disparity of knowledge levels. This seems to result primarily from: i.) a wide disparity in discipline and motivation ii.) political interference from family's with status in the community iii.) students are able to retake the achievement exams repeatedly until they pass. So a student who achieved 98 % on the exam initially will be in the same learning class as the one who finally achieved 51 % after a dozen attempts. In attempting to teach this diversity the bright academic students who want to learn are quickly, and easily bored. The weaker students struggle and require more support to learn. Add "open classrooms", a shortage of qualified instructors, and the cultural complexity of little self-discipline and respect for others, and you have a very challenging learning environment. The school is a microcosm of Ecuador - a competitive and open culture. The environment is very open with everyone knowing "everything" that is happening from academic results to personal lives and troubles at home. A young lady is selected as "school queen" for the year for each of elementary, junior, and senior groups. 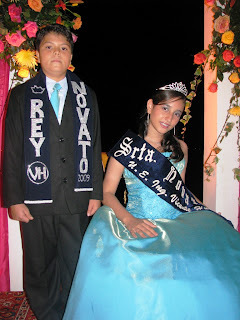 Noelia a very strong academic freshman student who was in my English class was selected as this year's royalty. It is not offensive here for the children to be labelled with what we would consider derogatory nicknames (fat, skinny, dumb, or racial slurs). Common in genetic composition throughout the world, academically strong students are not often also strong athletically and vice versa. One day the school held a track and field mini-olympics. Each individual's performance was viewed by the entire school community, and there was blatant ridicule and laughter at some of the student's athletic abilities. I had great empathy with those students who did not do well, as I have long since learned with my athletic talents it is best for me to lie down until any sporting urge passes!